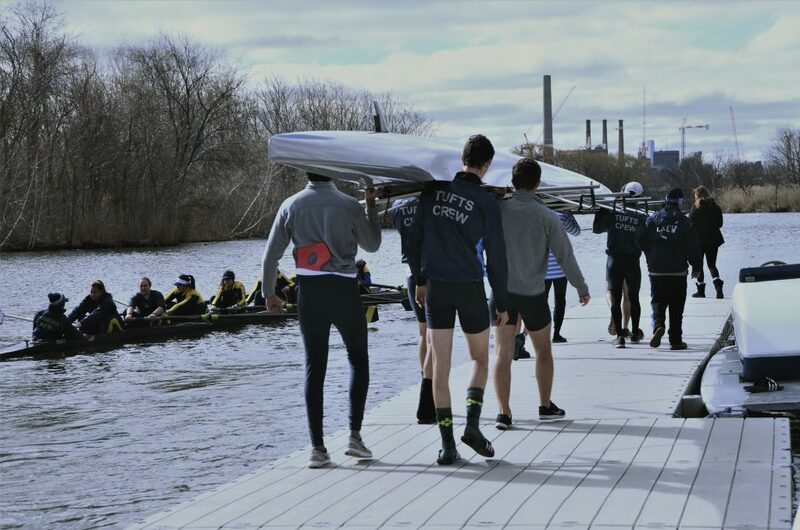 The Jumbos hosted two regattas on the Malden River over the weekend. Tufts competed against Amherst, Middlebury and UMass on Sunday, taking second out of the four teams. The day before, the Jumbos won two out of three races against the Coast Guard Academy. On Sunday, the Jumbos won four out of five races against the three other competing schools, losing only to the Middlebury Panthers, as the Panthers’ first varsity eight took the win by 4.1 seconds. Senior tri-captain Doug Burt was the bow for Tufts’ first varsity eight, which split its races on Sunday, defeating UMass before the loss to Middlebury. Tufts’ second varsity eight won its race against UMass, the third varsity eight took down Middlebury and the novice eight notched a win against Middlebury as well. The second varsity eight did particularly well over the weekend. The boat also won its race against Coast Guard, which means it had a perfect record in the two regattas on Saturday and Sunday. Burt credited the success to the second eight’s chemistry and coordination. Senior tri-captain Zach Merchant echoed Burt’s sentiments and explained that the team has benefitted from increased competition for the top spots on the roster. Along with the 10-second victory for the second boat, Tufts won another of its three races on Saturday against Coast Guard. Tufts’ third varsity eight also won its race, finishing first by a dominant 21-second margin. Sophomore Alec Whipple manned the third spot in that boat. Coast Guard edged out Tufts in the first varsity boat race. The Bears’ boat finished eight seconds ahead the Jumbos’. That makes Tufts’ first boat 1-2 on the weekend, with a close loss on each day. Looking ahead, Tufts will host another meet on Saturday as Bates, Wesleyan and New Hampshire will all travel to the Malden River. This will be the second-to-last regular season meet for the Jumbos. Burt noted that the team’s mentality is geared toward consistent improvement. Tufts will host its next regatta on Saturday at 9 a.m.